If you have any questions or suggestions you are welcome to join our forum discussion about Gaps, Trading Pullbacks After Gaps . In the current article we will present to you a fairly basic gap trading strategy, which is based on support and resistance zones and their ability to switch roles. If you want to learn more about support and resistance levels, read our articles “Support and Resistance, Part I” and “Support and Resistance, Part II“, as well as “Support and Resistance Levels in Weak Trends“. Let’s say a few words about gaps before jumping to the trading strategy itself. Gaps are a period of trading when a currency, stock or some other financial instrument performs a sharp move up or down, accompanied by very little trading. On the chart this is visualized by a gap between two consecutive bars. Gaps are most common in stock trading because, unlike the Forex market, stock markets close each day and any events which occur during the time of closure may result in the price opening higher or lower compared to the most recent close. The gap which is formed creates a new array of trading opportunities due to the different ways traders interpret gaps and trade them. In most cases when it comes to companies and their share price, gaps are formed following the announcement of major corporate news or the release of significant reports, while the stock markets are closed. At the start of the next session, if the released data was somewhat unexpected, it often causes a gap. In the Forex market, on the other hand, gaps are most often seen at the opening of the market on Sunday evening. Because the Forex market is decentralized, and thus operates around the clock, it rarely forms gaps during the working week. Instead, you can observe gaps between the closing exchange rate on Friday and the opening value on Sunday. You can rarely see a currency cross gapping during the week, at most for a couple of pips. Here gaps appear in intraday trading on a chart as large candles and form when an economic report causes a sharp move up or down, which is not accompanied by enough liquidity. – Continuation gaps – they form in the middle of a trend and reflect a rise in the number of market players who place with-trend entries. – Exhaustion gaps – they form near the end of a trend and reflect with-trend market players’ attempt to push the market to a final extreme, after which the trend usually reverses or enters a trading range. – Breakaway gaps – they occur at the end of a trend and signify the beginning of a new one. – Ordinary gaps – also known as common gaps, they can’t be placed at the beginning or end of any trend or pattern, thus have little-to-none predictive value. The trading strategy we are about to explain step-by-step is based on the price retracing back after the gap, or as we will call it – after the gap is filled. The gap is said to be filled after the price, which previously gapped, reverses and pulls back to the pre-gap level. These retracements are very common and happen for several reasons. First, as the price breaks out and reaches a new swing high or low, many traders lock in profits because they think that the move was overdone and will soon reverse. At the same time, many other market players begin to fade the swing extreme because they think they can reverse the market. Second, because the gap is a breakout through a resistance/support zone, which then plays the reverse role as the gap is filled, there are no other major resistance/support zones between the breakout point and the swing extreme. Thus there is nothing that could halt the filling. Also keep in mind that identifying the type of gap is crucial for predicting whether it will be filled out or not – exhaustion gaps get filled as they are followed by a trend reversal, but breakaway and continuation gaps are not faded. Typically, due to the lack of middle-way support and resistance levels, when a gap starts filling it will most often complete the retracement. Also, volume plays an important role in determining what kind of gap we have, thus how market movement might evolve next. Exhaustion gaps are usually accompanied by low volume, while breakaway and continuation gaps typically happen on the basis of high volume. Each trader has a unique perspective of market movement and a different view on how a certain move must be traded. As we said, some traders will buy the breakout as soon as it occurs, while others will fade it when a new swing high is reached. Others will wait for the gap to be filled and enter in the original direction as the previous support/resistance zone switches roles. We will turn our attention toward the latter strategy. First of all, as with almost each other trading strategy we have discussed, we will limit our scope only to with-trend entries. Therefore we will use multiple time frame analysis to determine the larger trend and enter only in its direction on the smaller time frame. For our example we will trade on a 15-minute time frame, while determining the general market direction on an hourly chart. We then need to identify a gap, which breaks through a major resistance or support zone on the 15-minute time frame, and afterward gets filled (retraces back to its pre-gap level). Let’s say we have a bullish gap. As the gap gets filled and the price falls back to the resistance zone but instead of penetrating it rebounds from it, this means that the resistance is now acting as support. Thus, we have a breakout pullback, which is a second long entry signal (the first one was the breakout itself), and secondary entries are more reliable than the the primary ones. In order to enter long in this situation, we need to see the price reversing back up from the support zone, and as soon as a candle closes above it, we can enter in the direction of the gap. However, before entering we need to have predetermined our stop-loss level and profit target. We can place our protective stop either several pips below a near major support/resistance level (the several pips are meant to protect the stop from being triggered by random noise), or at the most recent swing low (respectively swing high for a short position). As for the profit target, you should aim to reach the gap’s high. Check out the example below. On the above screenshot you can see a EUR/USD hourly chart which definitively shows that the market was in a strong bear trend at the period observed (colored in yellow). We then switch back to the 15-minute chart to more accurately determine support and resistance levels, as well as our entry point, stop loss and profit target. It is visualized below. After a major sell-off during the previous day’s US session the market entered a tight trading range which extended through the Asian trading hours. 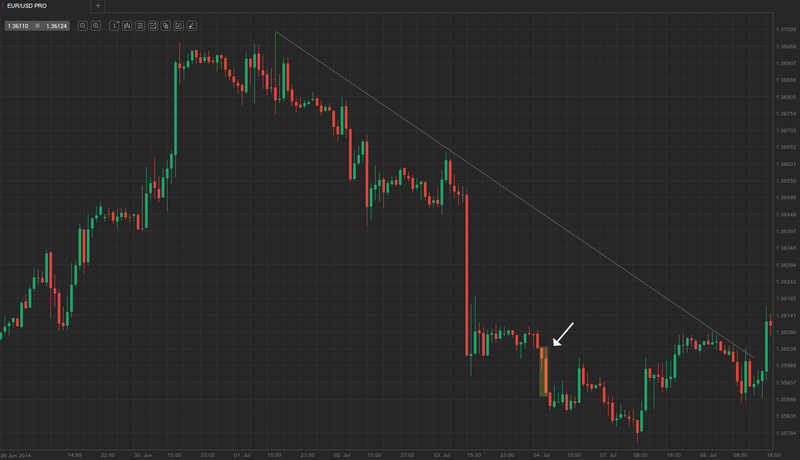 As the European session began, the market gapped down at (1) and penetrated the major support area of 1.3600. 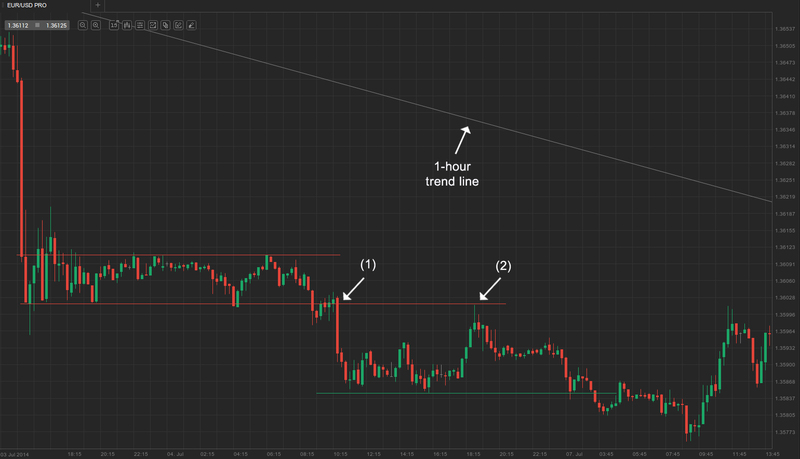 This set the stage for a possible short entry (in line with the general trend), if the gap gets filled later. And so it did at (2). As soon as the price retraced back to the support area, we wanted to see if it will switch roles and act as a resistance, like it did. Next, we waited for the formation of a definitive reversal bar, on which we can base our entry. Bar 3 was the first bearish bar which reversed the prior four bull trend bars and so it seemed like a suitable enough entry point, thus we went short below its low. Alternatively, we could have waited for a stronger bear trend bar as a reversal confirmation and the top-shaved bar 4 acted as such. Our profit target is the gap’s swing low, as marked by the green horizontal line, while our stop loss must be placed above a recent major resistance area (15-20 pips above the 1.3600 area). Later on our profit target is reached, rendering the trade successful.